This fried chicken dish that lets you cook your favorite marinated chicken in seasoned batches that make them mouthwatering and full of flavor. 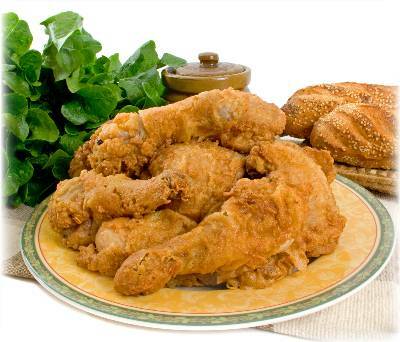 Traditionally Fried Chicken is a Southern favorite done California style with cornmeal. This recipe is easy to make and takes 6 ingredients. The result is tender, golden-reddish chicken with a subtle New Mexican spiciness. 1. In an shallow baking dish, stir together the cornmeal, flour, and Jake's Southwestern Hickory Dry Rub. Remove the chicken and thoroughly wash. Pat chicken dry with paper towels. Dip each piece of chicken in the buttermilk, hold up and allow the excess buttermilk/milk to drip away from the chicken pieces. Coat the pieces evenly with the flour, cornmeal, Southwestern Hickory Rub mixture and place on a large baking sheet. 2. In a large deep fry pan over medium-high heat, melt the shortening or heat the oil to 360 degrees checking with a deep-frying thermometer. Arrange the chicken, skin side down in the pan, placing the pieces of dark meat in the center and the pieces of white meat around the sides. Allow the pieces to touch slightly, but do not overcrowd the pan. Reduce the heat to medium and cook 12 to 15 minutes until the skin looks golden brown. Use tongs to turn the chicken, cover the pan with a lid and cook for 10 minutes. Uncover, turn the chicken again and cook until crisp and cooked through, about 10 to 12 minutes more. When done juices should run clear and not reddish or the color of blood. 3. Using tongs, transfer the chicken to a rack to drain. You can even use the rack from your oven range. Remove to a paper towel to draw out the excess oil. Serve piping hot, or even chilled, straight from the refrigerator.